I created this wearable art glass dimensional hand sculptured pendant out of a larger piece of glass. This technique is very labor intensive. I individually placed each piece of glass in the center. I am so proud of this technique and each piece is artist signed. This glass pendant has raised pieces of clear glass which is fused between layers of deep purple and purple iridescent glass. 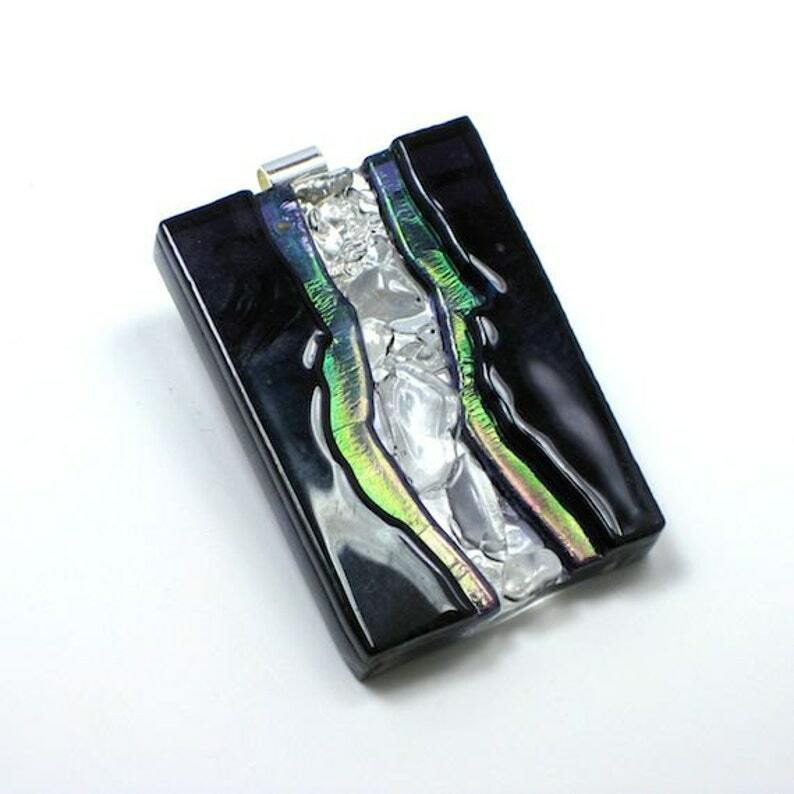 I have incorporated this dimensional technique of my larger glass sculptures into this statement pendant allowing you to get an original art glass sculpture to wear and enjoy at a fraction of the price. The pendant measures 2 7/8" h x 1 3/4"w x 3/8 thick not including the bail. The bail is a silver plated barrel. All Pendants come with a FREE black necklace with s sterling silver clasp . This allows you to wear this piece upon arrival, but you can place it on your existing necklaces. Our Jewelry is one of a kind. The descriptions are what I see and feel as the artist. No photographs can completely capture the brilliance of glass as it changes colors and appearance in differing light. Enjoy wearing my jewelry. Big, bold and dramatic with many a customer reporting getting noticed every time they wear one. Own a signed piece of JOY !